With the Trouble with modern fuel causing problems with the carb I thought we should take a look at the problems. I Pad ETC 2016 2017 End Of Year News Page. Ally Clift Where the Otter Story Began. An Australian BSA Otter Build. Andrew Paxton's Winning Cotswold BSA B40. Another String To My Guitar. Brian Browns Project 8x4 Peng Jian. BRITSHOCK'S Tools Of The Trade. BSA New Trials Engine Build. CCE Design Made In Italy. Classic Trials Show 2010 New Photos. Dave Wood's Sherpa198 A Rebuild. Deryk Wylde Off Road Review. DIY Otter Frame Build Page. Don Morley The Name Otter . Etienne Willems OTTER build page. Felix Eggenschiler's Foster B40 BSA Otter. Fitzroy What Have You Done. Fraser Hondas a forgotten breed. Gallery A few BSA OTTERS to view. Gary Britton's BSA Faber Mk3 Otter Build. Gary Britton's Second BSA C15 Build. Herberts Austrian Built BSA Otter. Herbert Poelz BSA Bantam Builds. HJH Motorcycles Made in Wales. Jialing JH125 rear wheel Transplant. Justyn Norek Jr Tests a CCM 350 Trials. Len Hutty Just A Star. Moto Parilla 175 Classic Trials. My Seven Best Builds BSA. OK Let's Build A BSA Bantam Trials Bike. Pat Slinn A Working Life with Sport Bikes. Scottish Pre 65 Two Day Trial BSA Otters. Seven Best Builds Royal Enfield. The Bike They Call Otter. The Butler Tempest Trials Bike. The Dan Shorey Bultaco Sherpa N trials. The Famous Ariel HT GON 786. The French Motobecane. We take a Look. The Mini-Otter Super Cub Project. The Mk1 Faber Framed BSA Otter. The Mud Plugger Build's Page. The Replica John Draper Cotswold BSA Build. The Square Framed BSA Otter. TLR Honda is it a Dream? Trials Lesson with Mick Andrews. Triumph Twins are the ones that Wins. Twinshocks Back To The Future. Villiers 1966 A Villi Good Year ? Works BSA Trial Outfit XJO 277. 2013 BSA Otter News Page. 2014 BSA Otter News Page. Haymaking to Threshing Part Of Growing Up. The Amal Mk1 and 1,1/2 Strip down, and Rebuild Page. (And all Carburettor related Stuff). After a urgent phone call and a missed trial after paying the entry fee. I thought not only One of you had found this problem after a machine had been left for a while with fuel left in the system. And even if the system had been drained you may still have the problem with the white corrosion. Ethanol just takes in its own weight of water so this is the cause water does not like zinc. or alloy to that mater. Remove your carburettor and drain. Lay an old table cloth or piece of carpet onto your bench. This is mainly to stop you from loosing parts by letting them roll off of a smooth surface. Yo have probably left the slide on the throttle cable of the bike? Leave that for a while. Remove the two screws holding the float chamber in place. Gently remove the chamber,the gasket may be stuck. Watch for the float and needle falling out and the bits scattering. See what I mean about the piece of carpet! Leave the bowl for now, prop it upright and drop the two screws back into there holes the wrong way up. You now have the body of the carb with the jets in,you can now remove and check the main jet and holder, be careful with the holder threads as you know what zinc is like. The carb will either have a pilot jet or bush, if it has a brass jet the carb is old or a two-stroke version, as these were changed in 1967-8 to a pilot bush.for four-strokes. This bush I have found is the main problem with this carb,and is probably blocked with crud. Unscrew the air screw and remove. behind this is the dreaded bush. I have found the best way of cleaning this bush out is with a length of old guitar string. And wearing a pair of magnifiers, to make sure you get through the pilot hole. There are two more airways that need to be checked on this pilot system ,two small holes either side of one side wall of the slide. The left photo from Amal shows them clearly. 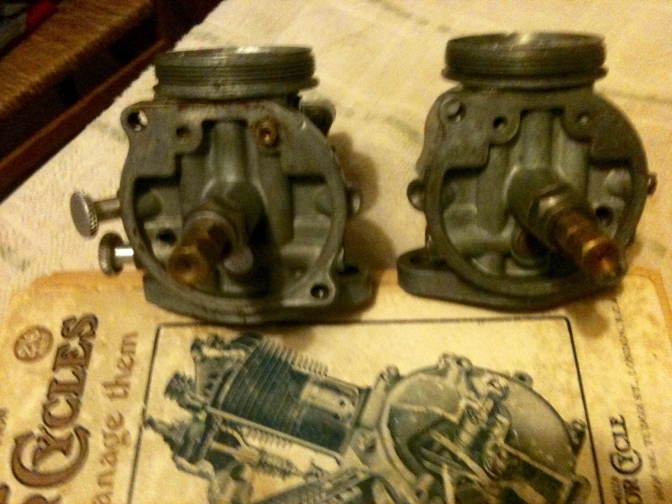 You can see here that the carb on the right is a "Bushed" pilot jet, because there is no pilot jet fitted, some of the carbs with a bush fitted did however have the threads taped into where the pilot jet was positioned. And dont forget that the pilot system is handed to use the side where the air screw is. The left photo you can see the pilot jet in the top right hand side. this is a old four-stroke carb, but the two-stroke versions still have pilot jets so I am told. Before we go any further here is what Amal say about this part of the carb. Mark 1 Concentric is equipped with two types of pilot jets. 2 Strokes use a removable pilot jet that should be replaced if it is damaged or shows signs of oxidization. 4 Strokes generally use a pressed in bush pilot jet in the gallery behind the pilot air-screw. Fuel residues and oxidization can cause problems with the pilot circuit, particularly in bikes that have been left standing with fuel in the carburettors for several months or more. It may be sufficient to clean the pilot circuit with an aerosol carburettor cleaner, stopping the various outlets selectively to ensure the entire system is clear. Do not forget to inspect the two pilot circuit outlet holes either side of the slide location slot in the bottom of the carburettor bore. If necessary the pilot bush can be cleaned by removing the pilot air screw and using a No 78 or 0.016"drill, held securely in a suitable extension, rotated lightly in the bush to remove encrusted deposits. When first introduced all carburettors were fitted with a detachable pilot jet screwed into a threaded hole in the bottom of the carburettor body. This arrangement is retained for 2 strokes but from 1968 was replaced for 4 strokes by a bush pressed into the gallery behind the pilot air-screw. The detachable pilot jet caused problems with some 4 Stroke engines. The remoteness of the jet from the two pilot circuit outlet holes caused starting and idling problems on bikes with lower manifold vacuums, and could cause stalling during deceleration due to a weak mixture. The introduction of the pilot bush moved the pilot jet nearer to the outlet holes to overcome these problems. The bush has a flow rate of equivalent to 20cc/min. Carburettors fitted with a bush retain the threads originally used to fit the removable pilot jet. OK we will continue later with some more photos when I have taken them. If you have checked the main body of the carb and main jet and they seem OK for you, and there was no over scoring on the side of the body where the slide runs. we can now go to the float chamber.If the slide was sticking in the chamber the body of the carb may be distorted and this could be a problem. there is a cure further down the page to try and rectify this. 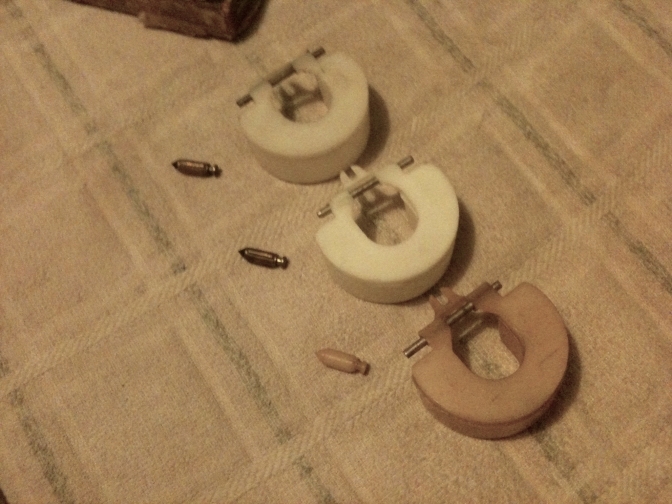 The two chambers above clearly show the age gap of manufacture, the one on the right is from the original Amal factory, with a nylon float needle fitted. 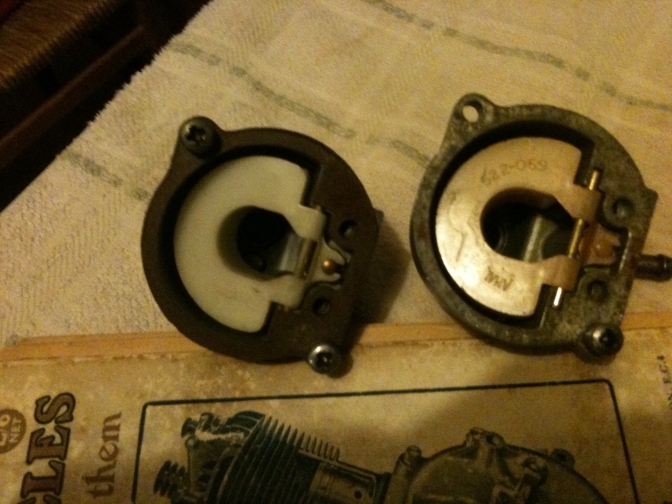 The one on the left has a later float and is brass with Viton rubber tip. There are now later stay up floats that are solid material and don't rely on the float not puncturing in the earlier versions, and you can adjust the hight of these by bending the metal tap. To adjust the hight without this float you will need an appropriate small drift to move the brass needle seat up or down. Although there is nothing wrong with the nylon needle if it works, replacing it with a Viton tipped one will probably be more reliable. The only reason to discard the float as I see it is if it is distorted and gives a false float reading and level. Or it gets eaten by the Ethanol fuel. Clean the bowel out and make sure there is no crud left in the bottom. If you have access to a ultra-sonic cleaner the best way to clean any part of your carb is with one of these. I have one on the way, so story later. One tip on reassembly of the float chamber unit is to gently centre-pop the body to hold in the float pin, but I am in two minds to use it. OK lets go back to the body for a minute. If you think this is distorted you can check with a straight-edge across the middle of the two fixing holes, with the rubber O ring removed. Hold it up to a light with the straight-edge across and if you can see a distinct ark of light the body has been over tightened onto the fibre or plastic heat sandwich, by an ham-fisted owner, or mechanic. Don't even think about lapping it with valve grinding past on a flat piece of plate glass or marble work top, ETC. This is not going to cure the problem just slim the flanges of the carb body. You may find if you put a vernier gauge across the choke of the carb on this side that it will be oval. The body has distorted with the over tightening and this is what is making your slide stick. The only real way unless you replace the body, is to make up a mandrill the same size has the choke of the carburettor, the spray tube will have to be gently drifted out for this operation. This mandrill will have to be drilled for a bolt to run through the centre and a thickish piece of flat machined plate that the carb mounting can sit on with more than an inch extra all around. The mandrill is lowered into the choke of the carb,and when it comes to a stop on the distorted part,the bolt is inserted through this mandrill and the plate and gently tightened,until it sits onto the plate. This should have persuaded the carb body to return to its original shape, a tip is to warm the body of the cab slightly before this operation. And then leave it on the mandrill and plate until it has returned to normal room temperature. (normalising). You may have now salvaged the body for reuse. I will do this operation later and take pictures for you. Look I am not going to over complicate matters by going into the different slides that you can get, the one that works for you is the one you need and there is more than enough information on-line with this information and also about jetting etc. 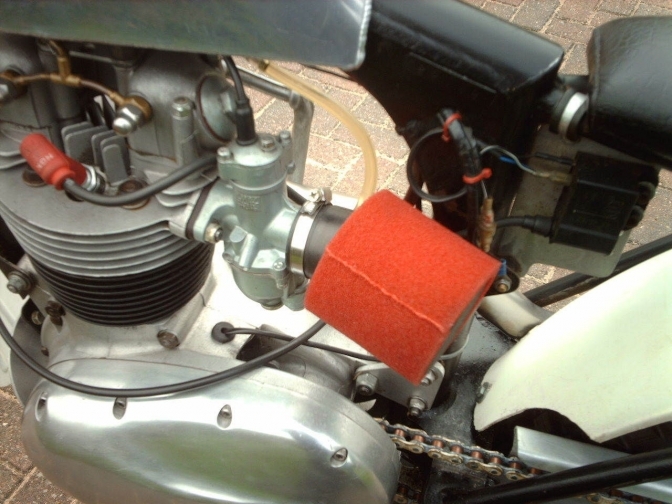 One of the big mistakes with these carburettors is that they were made down to a minimum price for the in deep trouble British motorcycle industry, so Jeff Binks and Barry Johnston were asked to design a carburettor that was has cheap to produce as possible. The Concentric was loosely based on a Mikuni design as the two companies had a loose relationship with other projects, at the time of design..
You can see that the influence of Mikuni as rubbed of on most of the Japanese and Chinese manufacturers. The Mk1 Concentric that they came up with was said to sell to the trade for as little as two pounds. So we should not expect too much. Zamak or Mazak as it was named in Britain, was used for the slide because it was cheap, being the same material as the body of the carb there was bound to be trouble, you don't have the same metal rubbing together. Even the Monoblock had a coated brass slide. So Problems with this Slide. "Well they do wear out sir", and has we now know the body of the carburettor does distort so with the two parts trying to change there shape we get galling (scoring) of the body and the slide which leads to the slide sticking,which is not good even on a trials bike. The old cure for a sticking slide on a Monoblok was to clean it up and then rub it with candle wax. But this would not solve the situation on a concentric. With the gap getting wider when wear sets in this causes more air to pass between the two surfaces and just adds to the running issues with the carb. Besides scraping the carb and buying a new one, there is only one way or perhaps two, but if you start boring out the body to fit an oversized slide you are probably wasting your time and money. So the last ditch attempt to salvage the carb is to make another mandrill similar to the one above,this can be turned from alloy, then it can can be gently pressed into the body of the slide chamber , hopefully returning the chambers roundness. There are slides made from other material, Brass ETC on the market, but is it really worth throwing good money after bad? After researching the Amal Concentric carburettor for this page. There is only one I would consider buying. It may be more money to buy, but I am sure that it is a far better bet, and must work a lot better than the Mazak bodied versions. and is easier to service. The AMAL Carburettor Company, (Burlen Fuel Systems Ltd), the world’s sole manufacturers of all genuine new AMAL Carburettors and spares, are pleased to announce the launch of a new Lightweight Premier Carburettor in Aluminium. As a further step in the improvement and development of their carburettors AMAL are now offering special light weight versions of their 600 Series Premier carburettors with the body and float bowl cast in aluminium. The carburettors include all the parts developed by AMAL for the Premier carburettor – hard anodised aluminium throttle valve, ethanol resistant Stay-up float, removable pilot Jet and aluminium needle valve and have been comprehensively tested on the road and have already clocked up several trials successes. Genuine AMAL jets guarantee accuracy and consistency of performance. The carburettors are available with bore diameters of 20mm, 22mm, 24mm, 26mm and 27mm and both right-hand and left-hand versions are available. The aluminium carburettor offers a weight reduction of around ¾ lb over the traditional zinc alloy type. 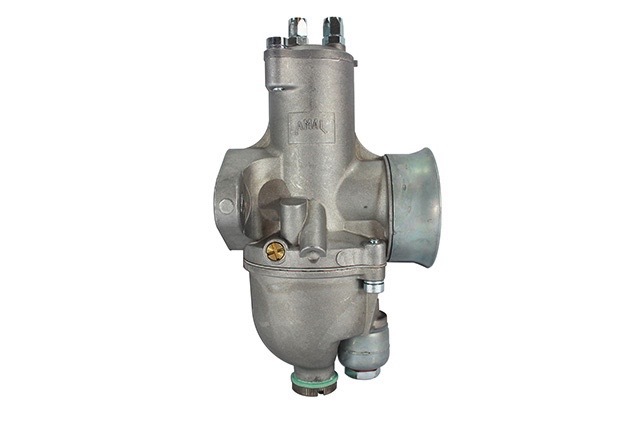 The carburettors can be supplied to standard specifications or customised to suit individual requirements and are supplied with the usual two year AMAL warranty, backed by our technical advice service available to all AMAL customers. Order From Amal direct, If you want a 20 mm one for your Cub to ride in that Scottish trial get your order in fast as they are not always in stock and have to be built to order in a lot of cases. The problem seems to arise from the fact that the float needle plunger , the part that holds the needle is higher,than the original, therefore making the needle seat further away from the needle when the chamber is full of fuel. So flooding occurs. has the needle is not shutting off the fuel. Bending the Tab does not seem to cure this problem. The only real answer as I see it is to move the brass seat upward ,by first heating the float chamber with boiling water, and then gently tapping the seat up slightly with an 1/8" alloy drift. Another theory I have is that the float may be heavier than is necessary, you may think this stupid but I have known of float bounce in the past. This means that although the float is floating, so should be shutting off the needle valve,but it may be only buoyant enough to just do this. I will purchase a "Stay-up Float" to test my theory. The answer may be as simple as drilling holes in the upper part of the float? ( Yes you have to re fill them ,but with what)? There Is an alternative , use the Nylon Floats and use ASPEN 4T fuel. This Amal Mazak Concentric carb has had Aspen Fuel sat in the float bowel all winter and you can see there is NO corrosion at all, and no need for a Stay-Up float. 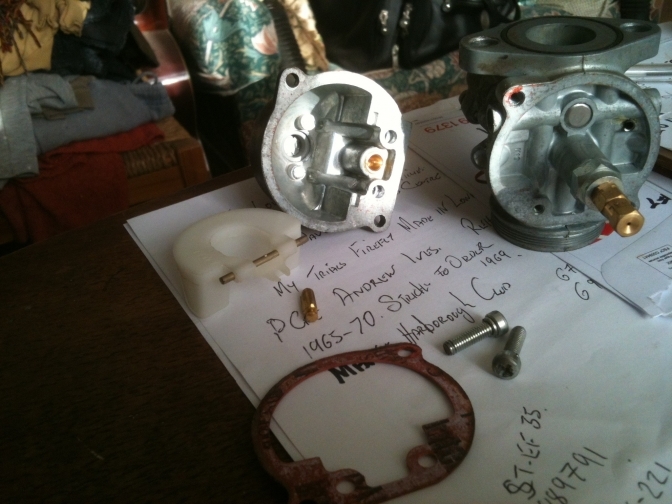 Right there is some controversy to where Amal carburettors are made. Well in England of course, In Salisbury Wiltshire. No No there not. Thy are! Some of the castings may not be actually cast in the UK and the Concentric bodies are actually cast in Spain, and some of the castings Amal use for other Carb's even come from China, but it is all about quality control, when the castings get back to England to be machined and then built up. Amal or Burlem fuel Systems have been making Carburettors some considerable time now, and that expertise should show up . Amal is not the only brand of Carb they own, and assemble, but most British Carbs from the past. So as I say you must use your head when you choose a Carburettor for your machine. As there are now choices and even Carburettors to the same design of the Amal Concentric Mk1. I wonder if these will be OK with the Scottish Two Day Trial committee? I am talking about Wassell of course. And because they look the same as a Amal Concentric . that does not mean to say they are. But they are not claimed to be built in England, but are another choice you can choose. And how about the Mikuni VM series basically the same but with more adjustment of parts, and I wont mention the price or even Pit-Bike parts. We will take a look at the Wassell and Mikuni carbs later. I am going to make one later. We Know it is a joke Right. But What if it works? More later we will see if it works. 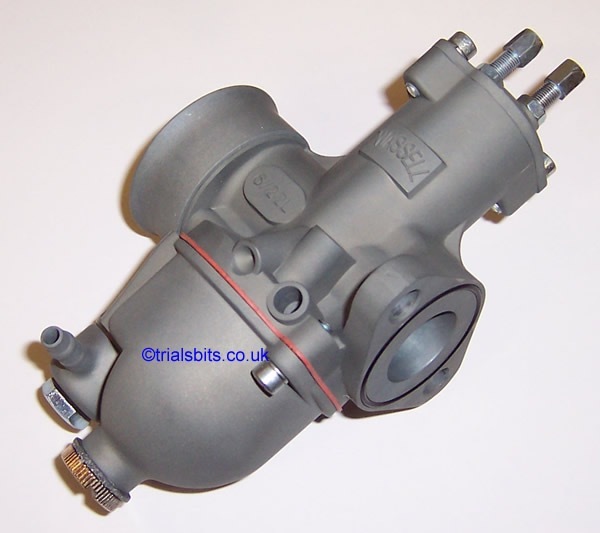 Trials carburettors, hints and tips. Firstly, a carburettor is (or should be!) a very precisely made part and wear or poor-quality control during manufacture will make accurate tuning difficult/impossible and often leads to other parts being changed or replaced in an attempt to rectify carb related problems. In some cases, brand new carbs may well be faulty, so bear this in mind if your bike ran ok before fitting a new carb. If the rules allow it’s a very good idea to avoid using poorly made zinc/lead body and slide carbs which are not resistant to modern fuels without alternative extra cost replacement parts being fitted first. Japanese manufactured carbs do not require alternative parts, are very durable and work extremely well if properly set up for specific applications. Choke size (carb internal bore) selected will very much affect the low rpm throttle response of any engine and is something that needs to be looked at quite carefully if you are wanting the best possible performance. However, as a general rule of thumb flat slide carbs with 2mm larger choke size will provide the same sort of low rpm response as round slide types that are 2mm smaller. Basic set up and tuning? In terms of setting up a carb from scratch this is something which is very much specific to the carb in question and there is plenty of manufacturer data to help with this. 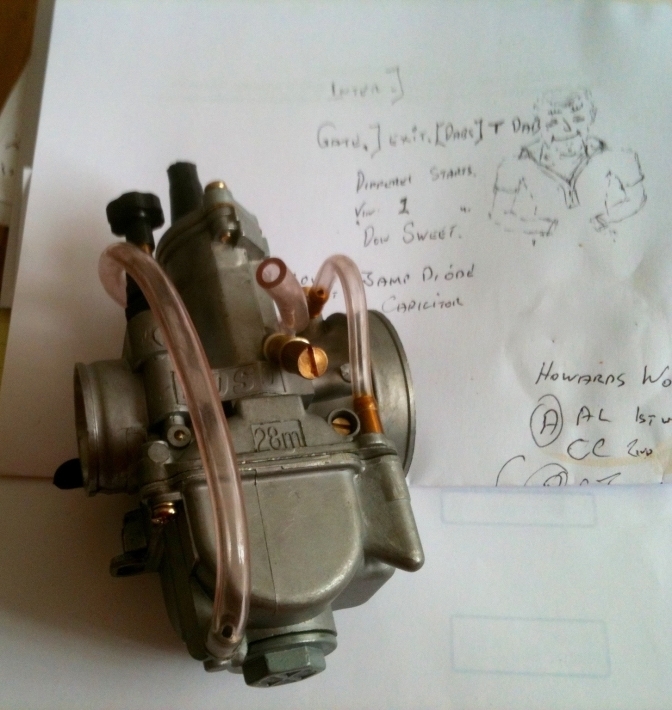 What follows is simply a thumbnail sketch of how to fine tune a carb set up which is already working relatively well. Firstly, there is a need to be confident that your motor is in good mechanical condition, exhausts on 2T bikes need to be recently serviced or new and to have the bike warmed up to normal running temperature. First thing to be adjusted is the pilot air (or fuel) screw. Set the throttle stop screw so the bike is just running. Pilot screw needs to be something like 1.5 turns out. Gradually turn the screw in until the motor just starts to falter and make a note of the position. Then turn the screw out again till the motor again starts to falter and note the position. Position of the adjustment screw needs to be between these 2 positions, with 1/8 turn toward richer setting (in if its an air screw and out if you have a fuel screw). If the bike is not responsive to pilot screw adjustments there are either other issues, or you will need to fit a smaller or larger pilot jet. If after you are happy with the pilot jet adjustment there is very slight hesitation or stumble at about 1/8 throttle position its possible that the slide cutaway is making the mixture either slightly too rich or slightly too lean. Slides though are in some cases quite costly, so we would suggest checking whether the slide you have fitted already is the one which is generally used for your bike, before buying a replacement with a different cutaway. Next thing to look at is the needle clip position, this affecting fuelling from approximately 1/8 to 1/4 throttle positions. If the bike feels a bit dead and wont rev cleanly in that throttle range try weakening the needle setting. This means moving the clip to the next highest position on the needle. If it feels as though its running out of fuel and maybe even detonating slightly, then you will need to richen the mixture by moving the clip to the next lowest position on the needle. You will see much mention of reading the plug colour to help with determining main jet size. Ethanol bearing fuels though mean that relying on plug colour readings is a very hit and miss process and can no longer be relied upon! If you have a selection of jets, its easy enough to test different sizes and work out relatively easily if running improves with an alternative jet fitted. In general, most trials bikes are jetted too rich and running will improve with a smaller jet fitted. However, if very oily 2T mixtures are being used there may be a need for a bigger jet due to the viscosity of the fuel mixture. If you are not restricted by the rules to British badged zinc/lead carbs then the best possible choice is a Mikuni or Keihin specifically set up for your particular application. A wide range of these carbs set up perfectly for many different makes and model of bike is available from Allens Performance in Nottingham, who also provide full spares and technical support services. This web site is to encourage owners of the BSA "Otter" trials bikes, To Form a single entity, as a club.